here in Chiang Mai, Thailand. They just look appealing, begging you to buy some, and I frequently give in to the temptation. 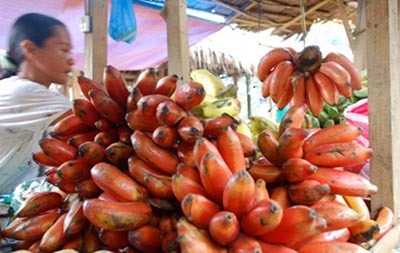 Almost all red bananas in the world are either full sized or dwarf versions of Musa Acuminata Colla (AAA Group) CV. Red Dacca. The cultivar originated in India, but has become very popular in Asia and Central and South America. Today, you can get them from wholesalers and high-end grocery stores in North America and Europe, but they're not nearly as common as the popular Cavendish variety that you find just about everywhere. Red bananas were actually some of the first to appear in North American markets, but they were replaced by Gros Michel by the late 1800s because they're less efficient to grow in plantation systems. The fruit grows on a very large pseudostems (they tower over you and can reach 18 feet) that often have highlights of purple and red in them. 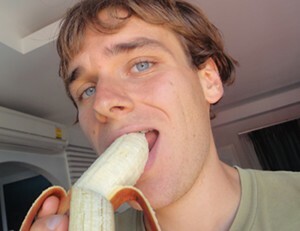 Each plant produces fruit in about 18 months, and the bunches of bananas are compact and full. I've seen some with over 100 medium-sized fruit on them, which splits into 4 to 7 hands. The skin starts off red and ripens to a deep purple color. Some start to get hints of yellow in them as they ripen. Peel them open and you'll find the flesh color to be a creamy off white. The consistency is smoother than Cavendish, and taste is sweeter, with just a hint of raspberry thrown in. A friend swears he tastes cinnamon in them too. In short, they're delicious, and worth a try. Learn how red bananas fit into a healthy raw food diet. Find more awesome fruit to drool over. Learn what foods are healthy and which you should avoid.